Microgaming created their first online cash casinos uk little over 20 years ago. New games are released monthly keeping their extensive list of released games growing and pleasing a wide audience with new and exciting themes. Microgaming delivers high-quality games and has developed more than 850 unique casino games so far, including 1,200 variants. The developer team at Microgaming is very energetic and always keeps up to date with technology providing products with the highest quality standards to their audience. If you are looking for the classic slot game experience you have found it! Cash Splash three reels is all about the traditional slot machines. The background is a plain blue and you will see all the information you need on the screen. On the top is the progressive jackpot and to the left underneath that are the reels. The right side of the screen is filled with the paytable so that you have everything overviewed quickly. Under the reels are all the rules summarised. On the bottom of the screen are all the playing controls, which are very simple and easy to understand. On the three reels you will find the traditional symbols like a silver seven, which is also the highest paying symbol, a pair of cherries and the bar, double bar and triple bar symbol. The symbols are nicely done and together with only one payline you will feel nostalgic. The Cash Splash logo is the wild symbol in this game and the way to win big prizes. The logo is represented by the name of the game in two separate banners and several coins and notes floating in the middle representing all the big Jackpot casino wins you may take home with you from this game. If you land one of the Cash Splash logos in a payline it will double the win. If you land two of them in a payline it will multiply your win by four. If you placed the maximum bet and you land all three of the Cash Splash logos on the reel you will be awarded the progressive jackpot. If you are looking for the classic slot gameplay experience and want to try a spin yourself you will have to place a minimum bet of 1 pound or up to 3 pounds. 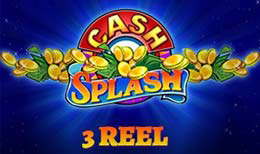 Cash Splash 3 reel is a great video slot to immerse you into the old and traditional slot games. It features only one payline and has all the classic symbols presented on the reels. The paytable on the side is very practical to be always aware of what is happening. If you manage to land the Cash Splash logo on the reels in a payline you may turn your spin very profitable for you as it doubles or quadruples the win of that round. Cash Splash 3 reel offers a great and simple gameplay experience that will entertain anyone who loves the old slot machines. Want to play more? Try this Slot Jackpot Game here.